Myth: almost every hotel booking site claims to offer the cheapest hotel rates online. Fact: Today I’m going to show you a sure-fire travel hack to ensure you’ve booked the cheapest hotel rates online. Even if the price goes down after you’ve booked! For example, take the gorgeous Bab Al Shams Resort in Dubai. A famous third-party hotel site was offering the cheapest hotel rates online – $1,392 for two nights. Using the sure-fire travel hack, it was still possible to get a further 35% discount on THAT rate. Find a price, hotel and website that matches your needs. Ensure the site has a free cancellation policy for your booking. IF a cheaper rate is available – on any website – for the same room, you will receive an email alert. You simply need to rebook at the new (cheaper) rate, and cancel the previous/existing booking. How does this system work though, is it safe? 100% – you don’t share your payment details with anyone other than the hotel booking website. It’s also free – you don’t need to pay anything else other than for the room. The system – Pruvo – is 100% secure and works by receiving a commission only from the booking website once you’ve stayed. There is no further cost to you. All you need to ensure is your original booking is made via a website that offers free cancellations. Most major sites such as hotels.com, Expedia, Trivago, Booking.com work with Pruvo – in fact, they all do! Pruvo will only look for rooms of the same type (.e.g Standard, Executive, Suite etc.) and will search continuously for lower prices. P.P.S. You’re also free to email Pruvo through their website – there is no difference in discounts or service. However, by using [email protected] shows you’re a supporter of Eat Drink Stay Dubai. How is this the best way to get cheapest hotel rates online? It is risk free – if there is no price drop after your original booking, there’s nothing to do. If the price drops, Pruvo knows about it – 100% of the time. It is free for you to use – Pruvo takes a commission from the hotel site. It saves you time – no need to keep tracking a multitude of hotel sites. It’s guaranteed to get you the cheapest hotel rates online – even after booking – for the room you’ve booked. It’s sure-fire – if the price changes, you’ll know about it, and the system won’t miss it. It saves you money – in some cases, up to 67% has been obtained. Bear in mind that’s a discount from websites that are often cheap to start with! You are in control every step of the way. 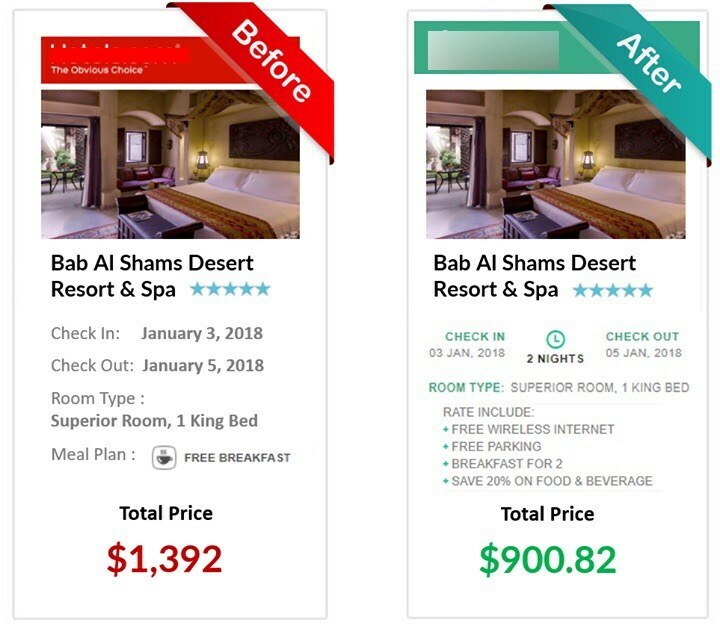 If you can’t be bothered rebooking when the cheapest hotel rates online change, you don’t need to. Disclosure: This post may contain affiliate links, which EDSD may receive a commission from at no further cost to you. Our editorial policy remains objective and impartial, and we only recommend services we already use ourselves. What do you think of this fail-safe travel hack to always get the cheapest hotel rates online? Will you be trying it? Where would you like to go? Join the conversation using the comments below!